Inky Fairy Designs: The party continues at The Greeting Farm! I'm back today with more new party friends celebrating The Greeting Farm's 3rd birthday! Today, I have previewed miss Amelia for you. I'm in the middle of a move so I have to keep this short and sweet and let me tell you how, um, interesting *challenging* it was to create my preview cards with half of my supplies packed up!!! LOL All I really had was access to my trimmer, *no dies, oh my*, some paper I left out that I knew I wanted to use with this release and my trims. I kept feeling like there was something MISSING!!! The sentiment is one of 3 included in the set and I created it to slide out from behind the pink cardstock. And don't forget to stop by to party with us at The Farm on Monday Aug 1, 2011 12:01a CST for a fabulous blog hop as we combine with the Farm Fresh Challenge Crew for your chance to win one of 3 fabulous prize packs!! Ohh what a fabby card you've made :o) Love it to bits. Wow! For not having all your supplies handy you sure made a FABULOUS card! I love it! Amelia is so darn cute!! For not having too many supplies you rocked this!! Beautiful coloring (cause all you need is your marker) and the flowers are so fun. 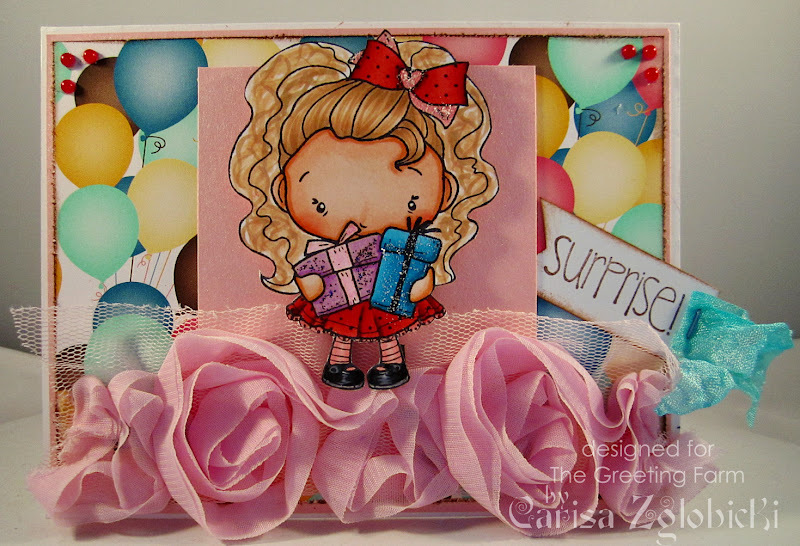 Gorgeous card Carisa! Have a great weekend! Oh dear, Carisa! How frustrating is that not to have your supplies handy? You would never know because your card is gorgeous! Hope your move is going smoothly!